5 Ways to Stay Productive… Even Through the Holidays! Life serves up enough distractions, now let’s add Thanksgiving and Christmas to the mix. Even if you don’t participate in these great traditions, your customers do. To continue your commitment to 10X production levels, it is mandatory to limit your distractions to the bare minimum. This is the time of the year when I make a complete list of all the activities that might possibly distract me. Then I look at the ones I’m willing to compromise on and be distracted by and the activities that I know have no value at all. Keep in mind that November and December only offer 33 weekday opportunities to work and the rest of the time is Thanksgiving, Christmas, New Year and weekends. Your last two months of the year are annihilated with distractions and that doesn’t even include parties, school, kids, ballgames and whatever other unplanned activities will show themselves. Make a list of all possible distractions. Create two columns on a sheet of paper. In one, list the things that won’t ever contribute to your production. In the other column list your “must-do” distractions – the ones not even you can negotiate your way out of! Then avoid those activities in column one. Remove all whitespace on your calendar. The days in November and December that are free from holiday distractions must be filled with calls, people to see and tasks to complete. Have a strict policy during those times for no distractions and commit to new levels of action. When people complain that they “haven’t seen you in ages,” you know you’re on the right track. The more things you get done, the less distracted you’ll be. Create time don’t manage it. Divide each hour into four 15-minute blocks of time and see how much you can complete in each 15-minute block. Work fast and furiously to see how much you can accomplish. When you start to approach time this way, you start to move from one thing to the next with little room for distraction. Share your commitment and get support. The more people know about your commitment and dedication the better. You might even want those closest to you to agree contractually to support you. Let your friends, family and colleagues know your goals are to double sales this month and that you need their help and support. Get obsessed!! The only way to knock out any distraction is to get completely obsessed. Become as consumed by your production as most people get over eating a fried bird on Thanksgiving and as obsessed as your kids get over Santa delivering gifts. Your energy and posture at work must take on an intense, obsessed-like nature. This approach will cause everyday distractions to seemingly disappear. This is when you don’t even hear the TV or other noise going on around you. Life is already filled with enough distractions and those consumed by distractions trade experiences for freedom. Successful people are willing to sacrifice the experience in order to build a future and do everything possible with the time they have. When you become completely committed to providing security for your family, the distractions that seem so appealing to the average person will no longer trap you. Successful people are willing to trade the distractions of today for greater freedom tomorrow. Use this holiday to build your hustle muscle and make choices that will result in the life you want, not just a life filled with endless distractions that control the everyday person. I wish I would have read this article a little sooner going to wrap the last 8 1/2 days of December up with a strong finish! Thanks Grant for always providing valuable and timely advice on how to succeed! ‘Create time don’t manage it’. I just went to weather.com and whenever I find myself doing that I know that I have too much time on my hands. Who cares what the weather is gonna be? I can’t control that anyways! Awesome, keep us posted on your progress. I can’t figure not having yet a GC book. I believe i must make an effort to buy one of thouse good books that time proved me, by many videos and emails like this i keep my eyes on routinely, that have the right to be important must have. I don’t even take, as GC says, important to get rich, i just want to control even if i am going to be poor the reasons behind. Best Regards. I needed this. I’m going to get in an obsessed. intense-like posture and work like a tasmanian devil in 15 minute segments and tell my friends and family to get factually and contractually out of my way! Excellent article Grant! I truly think that people find distractions to make excuses why they couldn’t work or get anything done. But then they wonder why they never become successful and start blaming everything but themselves. Get obsessed! 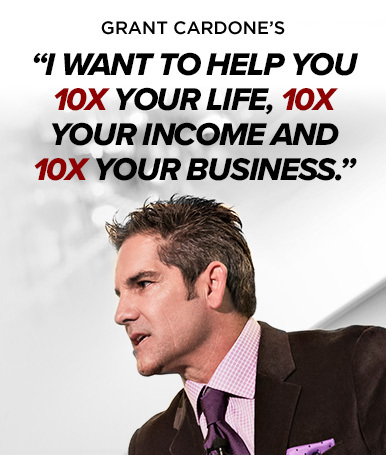 The most important lesson I learned from the 10X Rule. Staying focused on task takes a proactive approach. Learn to avoid distraction, this is vital for you to reach the goals you’re going to attain. Keep in mind this is a choice you need to make over and over again until its ingrained in your subconscious. Hey it’s holidays, but it’s not an excuse. Very timely. Will be implementing a lot of these. Thanks again! !